If you’re a regular visitor to Cooking in Cast Iron, you may have noticed one of our sponsors in the sidebar, MacGourmet Deluxe from Mariner Software. I’ve been tardy in posting a review of MacGourmet Deluxe, but it is so feature-filled, I’ve been taking my time learning all of its capabilities. I’ll be writing that review, probably later this week, not simply because they’re our sponsor, but because the program impresses me that much. In fact, they are one of our sponsors not because they contacted us, but rather because I contacted them after downloading the demo. Anyway, between now and Thursday, July 31, you an receive a 30% discount off the price of MacGourmet deluxe by going to the Mariner Online Store (follow this link, not the one in the sidebar for now) and then typing in the word “Happy” and then clicking the Go button. 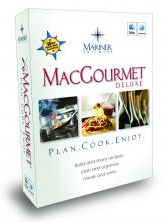 I’ve been very impressed with MacGourmet Deluxe and if you use a Macintosh computer, I believe you will be, too. Look for a full review by the end of the week.